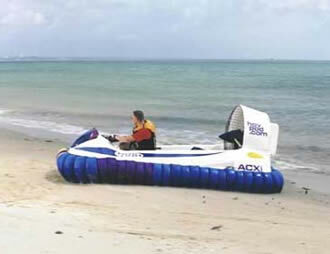 The following are some of the companies who sell large scale hovercraft. Fill in my contact form if you wish to add your company to this list, or for details of adding more information down the page than just a link. Why advertise with James' Hovercraft Site? This "Hovercraft Manufacturers" page alone has had over 5,000 hits in the last 3 months and is steadily increasing. The site itself receives over six times that figure having had 30,000 hits in the same time period. The addition too of the Concorde site has increased the potential viewing audience of this site greatly. That's why! 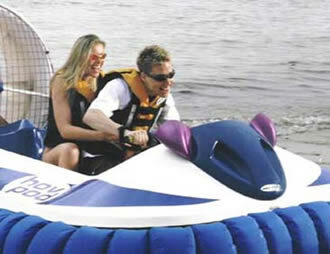 Hovercraft designed for marine leisure & commercial use. Hov Pod hovercraft are very easy and fun to drive; designed with marine safety in mind. These amphibious vehicles allow you to hover over any flat surface, including water, ice, snow, sand, mud, grass. Hov Pod hovercraft are safe, reliable, durable, & designed to make leisure hovercraft ownership easy. Need a demo? Want more information about HovPod craft? Go to the HovPod Page! AirLift Hovercraft's mission is to design, develop and manufacture the best performing, most reliable and most cost effective small to medium sized hovercrafts in the world. Australian Hovercraft Pty Ltd specialize in the design and manufacture of quiet high speed open-ocean Hovercraft & Surface Effect Craft. Custom built and very cost effective for Tourism & Commercial uses, Corporate & Personal applications, Military & Coast Guard Patrol. Griffon Hovercraft Ltd (GHL) produces the largest range of hovercraft available in the world today. Hovercraft designers, commercial hovercraft manufacturers, heavy lift hovercraft. Hoverwork and its parent company, Hovertravel, are the world's longest established Commercial Hovercraft operators. Hoverwork specialises in the provision of high speed amphibious hovercraft and related hovercraft expertise on a worldwide basis. We manufacture the Hov Pod in Southampton UK, a three man leisure hovercraft. We are one of Europe's largest manufacturer of hovercraft with almost 30 years in the industry! Amongst our clients are: Sea rescue, Coast Guard, Transportation business, Taxi companies, Fishermen, residents of the archipelago, competitive racers from all over the world. Neoteric hovercraft are recognized as the industry standard for rescue, commercial and recreational personal hovercraft. Founded in 1960, Neoteric is the world's most experienced hovercraft manufacturer, with clientele in 50 nations. The Neoteric Hovertrek ® is the only hovercraft available with effective brakes, and is the lightest and quietest hovercraft in the industry. We are a Canadian Dealer for Hovertechnics Inc., a large American manufacturer of hovercraft. Hovertechnics has delivered almost 800 craft to clients worldwide since 1984. Pacific Hovercraft NZ Ltd is an international company with more than 20 years experience in the hovercraft industry. Pacific Hovercrafts model range includes the sporty two and four-seater Slider, the six-seater Discovery, the 12-seater Explorer, and the 5 to 40 tonne Atlas hover-platforms. All craft are built to high standards so quality, performance and reliability are naturally a feature. Phoenix Hovercraft is an Italian hovercraft manufacturer specialising in hovercraft rescue systems. West Coast Hovercraft Inc.(WCHi), is a manufacturer and operator of high quality SEV style aluminum hovercrafts. WCHi builds 3 styles, with passenger payloads of 4, 25, and 80 respectively. A cargo model is also available.